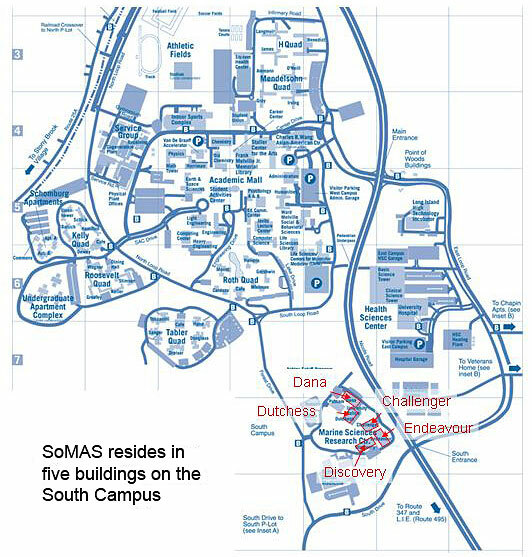 Take a Virtual Tour of SoMAS and Stony Brook University! From Route 347 continue north on Nicolls Road for 1.5 mi. At the first Stony Brook University entrance, turn left onto South Drive for 0.4 mi. At the stop light, turn right onto Marburger Drive for 0.2 mi. Turn right where you see the signs for University Police and Marine and Atmospheric Sciences for 118 ft and make a quick turn right for 0.2 mi until you enter the School of Marine and Atmospheric Sciences.